The School of Make Up Art proudly presents ”The Skin Base Sculpture” Masterclass…Limited Attendee Numbers…only 28 places available…hosted By David Horne sharing tips and technique tricks with this amazing new base. 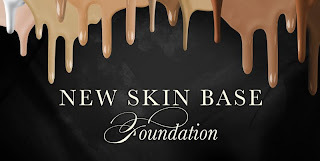 See the cult foundation as seen in VOGUE in action demonstrated on 3 different skin tones and see ‘Cutting’, the art of sculpting with foundations brought to life. Where: Illamasqua Beak Street Flagship store, W1.